The Clubhouse will open on May 17 at 5:00 p.m. The 2019 annual Kids’ Fishing Derby will be on July 5th, Friday, from 8:30 to 11:00 am at Aspen Lake. It is open to all children and grandchildren of owners and their guests who are 12 years of age and younger. No fishing license is required and we have prizes ($25 gift cards) for the child who catches the most fish, the biggest fish and the youngest child to catch a fish, but only one prize per child. If any prize goes unclaimed, we will figure out a way to award it. Adults are welcome to assist the children as needed. Every child who comes out gets a coupon for a free ice cream at the Club House. Valle Escondido, Spanish for Hidden Valley, is a northern New Mexico community nestled in the Sangre de Cristo mountains at an elevation of about 8500 feet. The community is made up of permanent and part-time residents with a variety of interests and backgrounds who share a love of this place. Besides the beautiful scenery and weather, Valle Escondido is a perfect place for golf and has a nine-hole course which is open to the public. The “walking-only” course is great for all levels of players. Watering is restricted to the tee boxes and the greens, leaving the fairways to rely on mother nature for water. 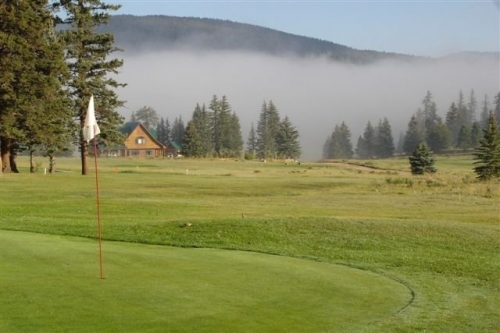 The whole course is groomed and maintained to insure it plays as well as possible. This type of maintenance respects the environment as well as the history of the sport. The Clubhouse, with a full bar and a deli operation, is a welcome oasis after a round or anytime you want food, drinks and fun. Come play with us! Stay current on Valle Escondido Golf Course and Clubhouse events by subscribing to our email list. Check the white board outside the clubhouse for the slash pile status. Our new Firewise Committee is working hard to keep us informed on smart fire prevention practices. Please go to the Firewise Community page for more information. For balance sheets and financial activity please visit our Financial Reports page.